Heat oven to 400° F. Pierce squash with fork; place in ungreased square baking dish, 8x8x2 inches. Bake uncovered about 1 hour 30 minutes or until tender. Cut squash lengthwise in half; remove seeds and fibers. Reserve one half for another use. Remove spaghetti-like strands with 2 forks. Toss squash, spaghetti and remaining ingredients. Return spaghetti mixture to squash shell to serve. 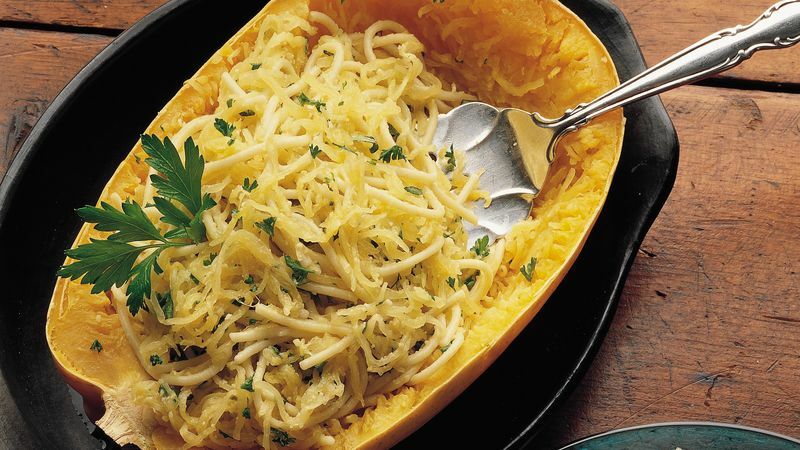 Spaghetti squash gets its name from its flesh, which when cooked separates into yellow-gold spaghetti-like strands. Microwave to the rescue! Pierce squash with fork; place on microwavable paper towel in microwave oven. Cook on High 16 to 19 minutes, turning squash over after 8 minutes, until tender. Let stand 10 minutes; continue as directed.